Have you edited an article and noticed some text within brackets? These are shortcodes, and they allow insertion of custom code or data into a Letterpress Commons article or press page. For more information on how to include shortcodes within the editor, please consult the WordPress documentation of shortcodes. The shortcodes currently supported at Letterpress Commons are listed below. The basic shortcodes that Letterpress Commons uses are pretty easy to learn and to use. These are not necessary, but may make your job easier and your article more helpful. 3 so consider Vandercooks for your retirement portfolio. A Vandercook Universal I has appreciated to $4,000 in 20122 so consider Vandercooks for your retirement portfolio. Vandercooks are the fastest growing type of letterpress printing press in the United States. [caption] will make sure the image is formatted to look nice, will create a clickable “zoom” image, and will ensure that the content creators receive the proper attribution. The core parameters for the [caption] shortcode are shown at wpseek.com. We have added some custom parameters credits and creditslink as shown below. This is how an image will import into a post by default, when you add an image via the “Add Media” button at the top of the editor. [caption id="attachment_1607" align="alignnone" width="421"]<img class="size-medium wp-image-1607" alt="Danse Macabre 1499" src="https://d1mkprg9bp64fp.cloudfront.net/wp-content/blogs.dir/2/files/2012/10/2.3.7_Danse-Macabre-1499-421x318.jpg" width="421" height="318" />First known illustration of a printing press. By default, the caption will include a text credit of the Credit field set in WordPress’s Media Manager by the editor or contributor who uploaded the image. You can optionally override this default caption and apply a link to this text by using two custom parameters inside the shortcode, credits and creditslink. The shortcode can override these defaults, and add a hyperlink, with these two parameters. [caption id="attachment_1607" align="alignnone" width="421" credits="Steven Saxe" creditslink="http://www.google.com"]<img class="size-medium wp-image-1607" alt="Danse Macabre 1499" src="https://d1mkprg9bp64fp.cloudfront.net/wp-content/blogs.dir/2/files/2012/10/2.3.7_Danse-Macabre-1499-421x318.jpg" width="421" height="318" />First known illustration of a printing press. 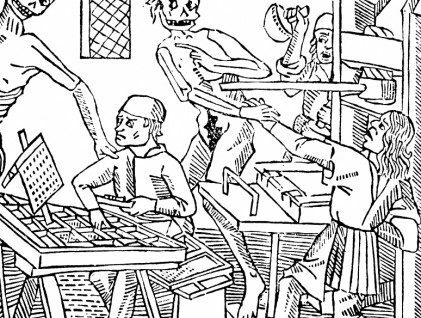 First known illustration of a printing press. If you’re a Letterpress Commons power user, you might find these other shortcodes handy. They’ll take a bit more configuration. We’ll be happy to review your usage if you save a revision and leave a comment in the post next to your attempt. This code adds a map to your page, optionally filtered. The list of filters is available on the Print/Trip status page. You can see each of the available filters or press manufacturers to apply. If you have multiple filters or manufacturers, simply comma delimit them. By default the map will be unfiltered. filters An optional comma delimited list of filter slugs. manufacturers An optional comma delimited list of manufacturer slugs. This creates a fixed column datatable of documents stored at Letterpress Commons. This can be added to any page to show manufacturer-specific documents. manufacturers Comma delimited list of manufacturer slugs to filter the table contents. This code brings up a list of recently edited articles, as an HTML unordered list. An optional header can appear at the top. order Sort ascending or descending. Valid values are ‘ASC’ or ‘DESC’. Default: ‘DESC’. Do you want to appear on this map of letterpress resources? Update your account to add your location and adjust how it appears on Print/Trip. This code is reserved for the main Print/Trip page. This code is reserved for the Print/Trip service API. This is not currently active.